Following a successful training camp in Florida over the winter break, the McMaster University swimming team is back in action. After having the opportunity to bask in some much needed sun during outdoor training, the Marauders returned north of the border to prepare for the upcoming Ontario University Athletic swimming championship on Feb. 8. For head coach and McMaster Hall of Fame swimmer Grey Fairley, Marauder pride runs deep through his veins. Known for often saying, “My name is Grey and I bleed maroon,” to his swim team, he knows exactly what it means to be a McMaster student-athlete. To those around him, Fairley is not just a coach. He is a mentor. Fairley and the Marauders hosted both the Guelph Gryphons on Jan. 16 and the Ottawa Gee-Gees on Jan. 19 in dual meets before finishing off their busy week at the University of Toronto’s Invitational. Entering into the team’s second half of the season, Fairley used the meets as a way to prepare the Marauders for championship season. “I thought their effort was exceptional,” said Fairley. “It really gave me the information that I’m going to need moving forward on who to select for the team and what races they should be doing at the OUA Championships. Success is not a brand new experience for the third-year swimmer. Muizelaar has been to the OUA Championships twice before and has already qualified for this season’s U Sports swimming championships being held Feb. 22-24 at the University of Toronto. Working with Fairley has helped Muizelaar become one of the best in the pool, helping him succeed in his career as a student-athlete. The McMaster women’s team dominated at the Fairweather Division Championships in Guelph, taking home 10 out of McMaster’s 12 medals. Although the men are not ranked within the top 10 by U Sports nationally, the women have been able to remain in eighth place, eight points ahead of the Dalhousie Tigers and the Western Mustangs who are tied for ninth place. Earlier this season, the McMaster women’s team dominated at the Fairweather Division Championships in Guelph, taking home 10 out of McMaster’s 12 medals. First-years Veronica Nichol, Isabelle Lei Sarah Little veteran Olivia Chow were among those who stood out. Fast-forward to the dual against Ottawa and Chow has only gotten better. After all three meets, like most athletes, Chow still sees room for improvement within herself. But she, along with the entire team, plans on using the next few weeks to get much needed rest and recuperation before the provincial championships. For Chow, this should not be hard to do. During last year’s OUA championship, she brought home the team’s lone gold medal on the third day, sporting a time of 32.11 seconds in the 50m breast stroke. Chow added a silver medal for 100m along with four other medals to add to her trophy case. Chow’s time as Marauder may be coming to a close but the women’s team is in good hands with a number of high-performing swimmers who have competed extremely well this year, like the rookie trio. And with Muizelaar, Mohamad Jrab and Alex Tropynine who all finished within the top three for the 400m at the U of T Invitational, the men’s team has a promising future ahead as well. 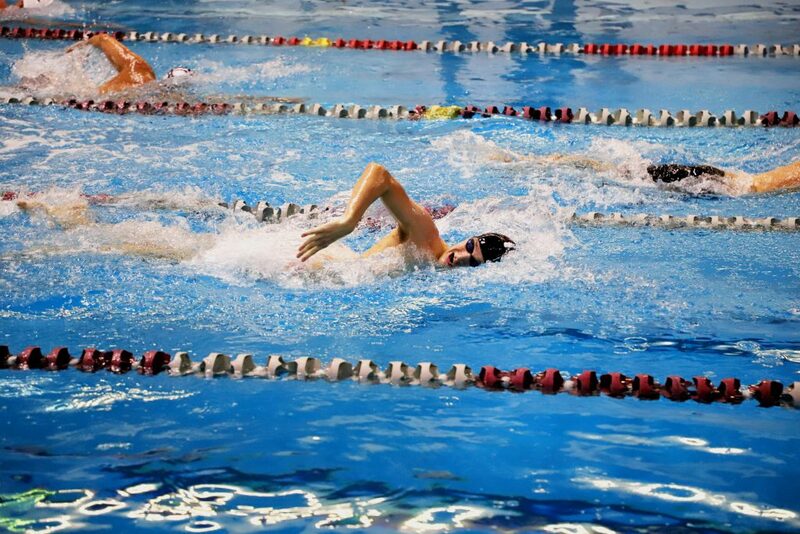 The last few days have been a bit of a whirlwind for the McMaster swimming team, but they are looking forward to the next two weeks as they bring down the level of intensity to prepare for the OUA championships. And for Coach Fairley, that requires three simple things: Getting a lot of rest, saying your prayers and being a “hulkamanic”.